"Life offers you a thousand choices...all you have to do is to take one." Speaking of trips and travelling, let me tell you about the time my family and I spent two days at our favorite getaway destination -- Tagaytay. We had Kong Kong (grandfather), A-I (aunt) and even my in laws in tow so with a big group, we seriously have to plan our meals properly. For one of our lunches, we headed to Marcia Adams' as it's one of the few restaurant who willingly allowed us to make a reservation. Since we were staying somewhere in between Alfonso, Cavite and Tagaytay City, this also was a perfect choice. Reading about the restaurant, it's said that the design of the house is similar to one of those Tuscan villas. Cobble-stoned walls, lush trees and greeneries and vintage wooden decors here and there. The only thing that we were not informed about was their Php. 700 consumable rate per head. Not a lot are hearty eaters in the family so we somehow panicked about this rule a bit. Thankfully, they were quite lenient seeing we got a number of senior citizens and kids with us so they allowed them to share. *phew* Wish they informed us beforehand though. Since Paul and I were neither part of the senior or the kids category, we opted to order a 3-course meal each to share. 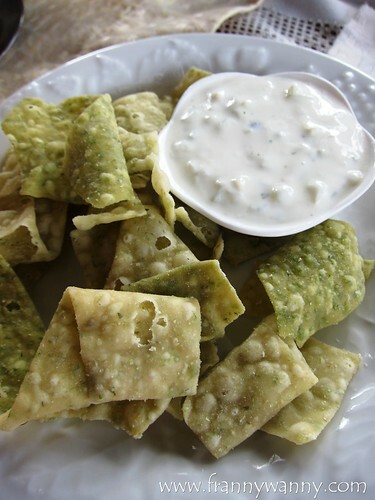 For starters, we had the Tzatziki with Lettuce Chips. I have to admit that while I love tzatziki and pretty much all types of Mediterranean dips, I found this to be quite bland to be fully enjoyed. Even the lettuce chips were lacking in flavor so it didn't help perk up the taste at all. 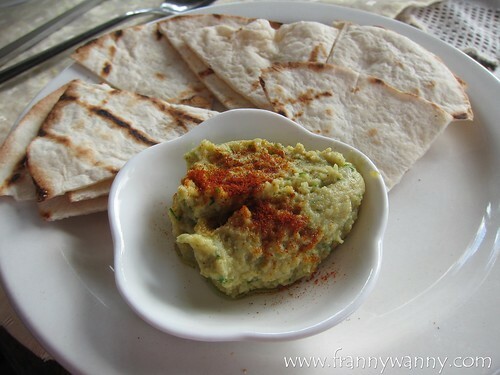 Thankfully, Paul's Hummus with Whole Wheat Tortilla was so much yummier and we chose to munch on that instead. It's funny though to see green hummus as it's normally pale brown. Whatever works, I guess. This one is a yummy blend of chickpeas, garlic and oil. Pretty much the usual stuff that makes up hummus so I'm not sure what they've added into the mix to make it green. Basil leaf? Pesto? Slime? Hehe..kidding! 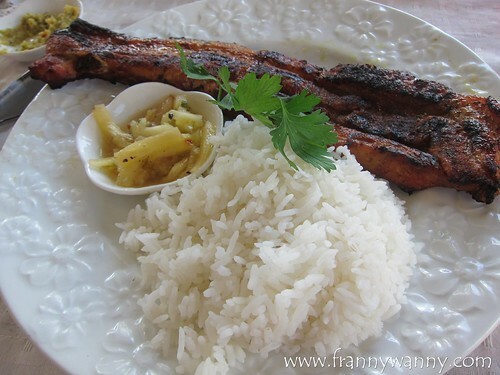 For our mains, Paul had the Aromatic Pork (Php. 700) which I have to say was pretty impressive. It may not be very aromatic as promised but it sure was tender and delicious. I guess that's the most important thing, right? We were also surprised at the serving which was good for two to share. Thumbs up for this! Meanwhile, I had the Chicken Kebabs (Php. 700) which was also an impressive long skewer of tender chicken cubes and veggies. It's served with their homemade oil-based dipping sauce which was pretty good too. 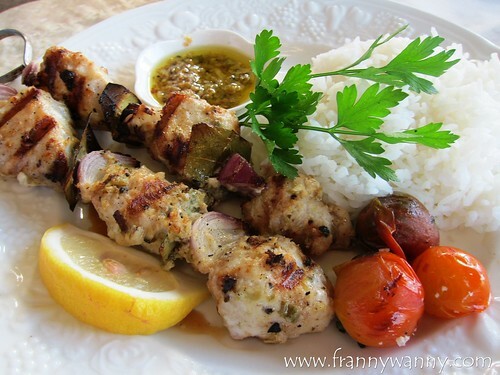 I just wish they also have some garlic cream sauce available which is how I love pairing my kebabs with. For dessert, we went for the Fried Bananas with Chocolate Dip which somehow deviated from the over-all Mediterranean feel but since we're in Tagaytay, then fried bananas it is! Nothing fancy about this but all of us, even the kids, enjoyed this dessert very much. 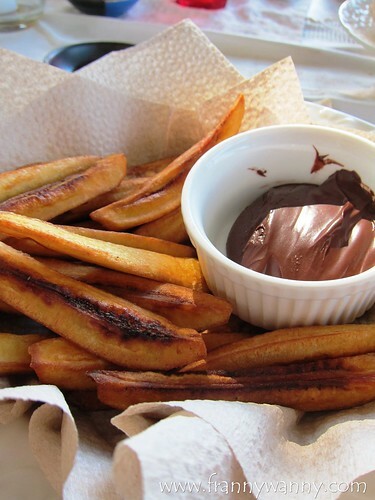 Of course, how can you say no to fried bananas with hazelnut chocolate, right? 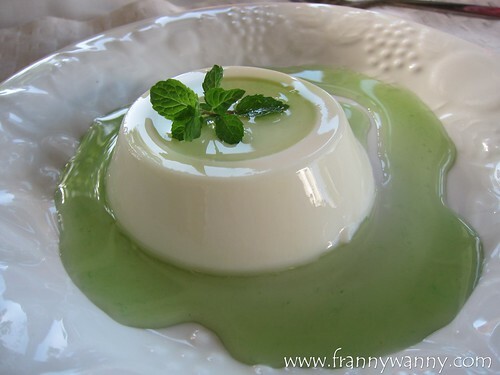 We also tried the Panna Cotta with Lemon Sauce. Love the silky custard with a nice citrusy note in every bite. I just felt like the mint on top was a bit out of place. 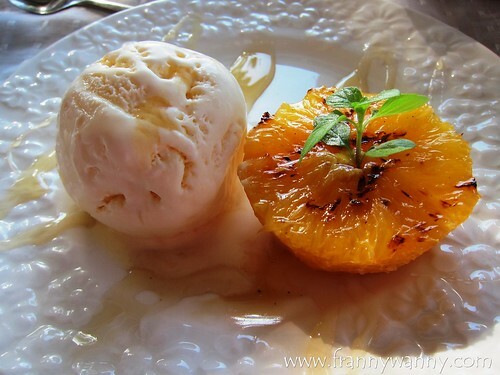 Lastly, we had the Grilled Orange with Vanilla Ice Cream which surprisingly was a yummy combination! As you can tell, we really enjoyed our meal at Marcia Adams' saved for the appetizers which was a bit ho-hum. The ambiance was really beautiful and since it's surrounded with trees, we enjoyed the cool breeze all throughout the meal. The only challenge was the steep incline at the entrance which is not very accessible for the elderly. Marcia Adams' is indeed a great place to visit but do take note of all these limitations especially when visiting with young children and elder family members. 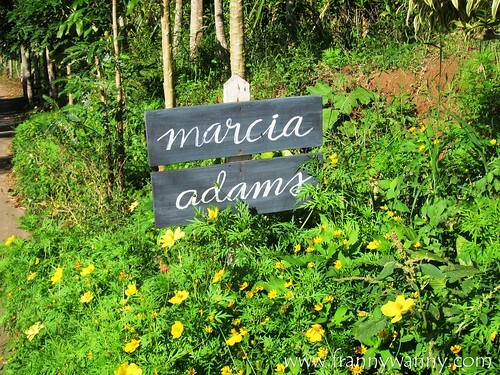 Marcia Adams' is located at J.P. Rizal street, Barangay Sikat, Alfonso, Cavite. Message them at +63-917-8011456. The best way to get there is via Waze.